One of the state's Republican leaders is leaving his current post with a higher office apparently in mind. Tom Cross is stepping down as leader of the Republicans in the Illinois House. Without a leader to lead them, will the Illinois House Republicans now be like a Mundelein freerange chicken with it's head cut off? Not a pleasant thought. It's no secret that Mundelein Republican legislator Ed Sullivan Jr, has been openly coveting the post. At least, someone has been dropping rumors to that extent into the MSM. Just don't ask your LakeCountyEye who. Everything else being equal, the job is Sullivan's for the taking. By your LakeCountyEye's count, the House Republican Caucus has a super-minority of 7 members. Which means Sullivan needs 4 votes to become the next House Republican leader. Realistically speaking, Sullivan can count on his own vote -- so he actually only needs 3 other legislators to vote for him. There must be at least 3 other Republican legislators in the burbs who would give him their vote. Like a David McSweeney or somebody. If Sullivan isn't able to round up a crumby three more votes, he might just not be ready to be the next House Republican leader. Just Sayin! Haha, j/k. 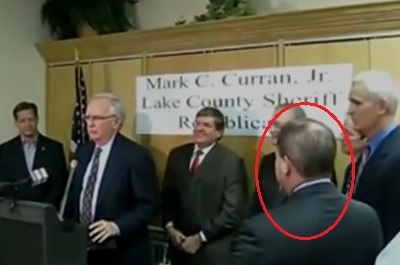 Everybody is now saying the next House Republican leader will be some guy your LakeCountyEye never heard of, named Jim Durkin. The end. There are 47 Republicans in the House, not 7. All 47 get to vote on the next leader.